In the seaside town of Margate you'll find Ruskin, a contemporary clothing boutique filled with distinctive designs. 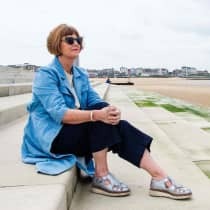 Founded by Garrie and Shelly Keeys, Margate locals who have lived in the area for 30 years, the boutique is known as much for its gentle and friendly customer service as it is for its beautifully curated clothing range. "We love design of all kinds, and we're lucky to say that we have a range of excellent suppliers that we now count, after 4 years, as friends."